Fri., Jan. 19, 2018, 8:52 a.m.
SRINAGAR, India – Tensions have soared along the volatile frontier between India and Pakistan in the disputed Himalayan region of Kashmir, as rival troops shelled villages and border posts for a third day Friday. Three civilians and two soldiers were killed on both sides in the latest clash, officials in the two countries said, as each blamed the other for initiating the violence. Indian officials said two civilians, an army soldier and a paramilitary soldier died and at least 24 civilians and two soldiers were injured in Indian-controlled Kashmir. According to Pakistani officials, Indian fire on Friday killed a civilian and wounded nine others in Sialkot in Pakistan’s eastern Punjab province. 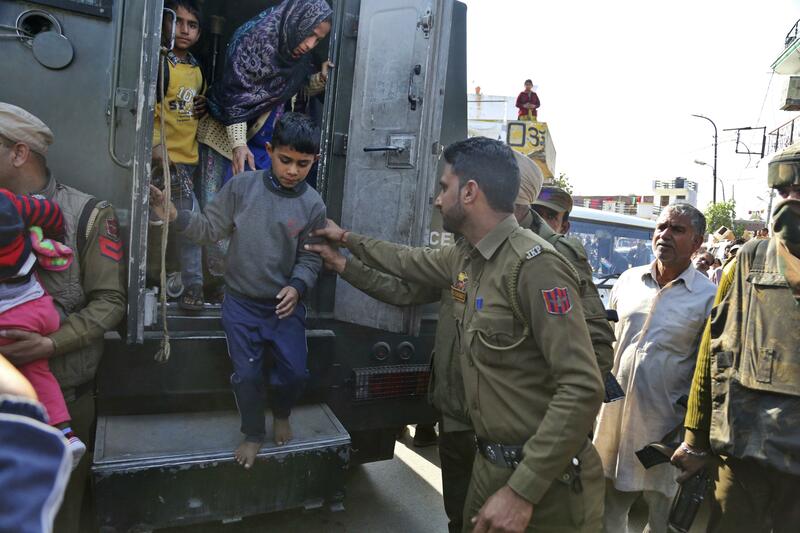 An Indian paramilitary officer said soldiers were responding to Pakistani firing and shelling on dozens of border posts and called it an “unprovoked” violation of a 2003 cease-fire accord. Angered over the rising violence, Pakistan’s Foreign Ministry summoned Indian Deputy High Commissioner J.P. Singh and condemned what it called “unprovoked cease-fire violations” by India. Each country has also accused the other of initiating past border skirmishes and causing civilian and military casualties. The fighting is taking place along a somewhat-defined frontier where each country has a separate paramilitary border force guarding the lower-altitude 125-mile boundary separating Indian-controlled Kashmir and the Pakistani province of Punjab. The contentious frontier also includes a 460-mile rugged and mountainous stretch called the Line of Control that is guarded by the armies of India and Pakistan. The Indian officer, speaking on condition of anonymity in keeping with official policy, said Friday’s shelling came after relative calm overnight in Jammu following two days of fighting that left at least three civilians and a soldier dead and several others wounded on both sides. The border guard official said by Friday evening fighting had stopped in most places but continued at about half a dozen outposts. The fighting escalated late Friday in Sunderbani sector, where Indian and Pakistani soldiers fired guns and mortars at each other’s positions. Col. Nitin Joshi, an Indian army spokesman, said one soldier was killed in the Pakistani firing. Indian police officer S.D. Singh said shells have landed in dozens of villages since early Friday. He said authorities deployed bulletproof vehicles to evacuate people who were injured and sick. Bullets and shrapnel scarred homes and walls amid the intense firing and shelling. Dozens of schools in villages along the frontier have been closed and authorities advised residents to stay indoors as shells and bullets rained down. Some damage to houses was also reported on the Indian side. Pakistan urged India to respect the cease-fire, investigate the latest incidents and maintain peace on the frontier. It also asked India to allow the U.N. Military Observer Group in India and Pakistan to play its mandated role in accordance with Security Council resolutions. “This unprecedented escalation in cease-fire violations by India is continuing” since 2017 despite calls for restraint from Islamabad, Pakistan’s statement said. India and Pakistan have a long history of bitter relations over Kashmir, a Himalayan territory claimed by both in its entirety. They have fought two of their three wars over the region since they gained independence from British colonial rule in 1947. The exchange of fire comes days after Islamabad accused Indian forces of killing four Pakistani soldiers along the Line of Control in Kashmir, where rebel groups demand that Kashmir be united either under Pakistani rule or as an independent country. Nearly 70,000 people have been killed in the uprising and the ensuing Indian military crackdown since 1989. Published: Jan. 19, 2018, 8:52 a.m.